Through its six agencies, the Institute for Public Service assists local governments, businesses and law enforcement to make a significant impact on the state. 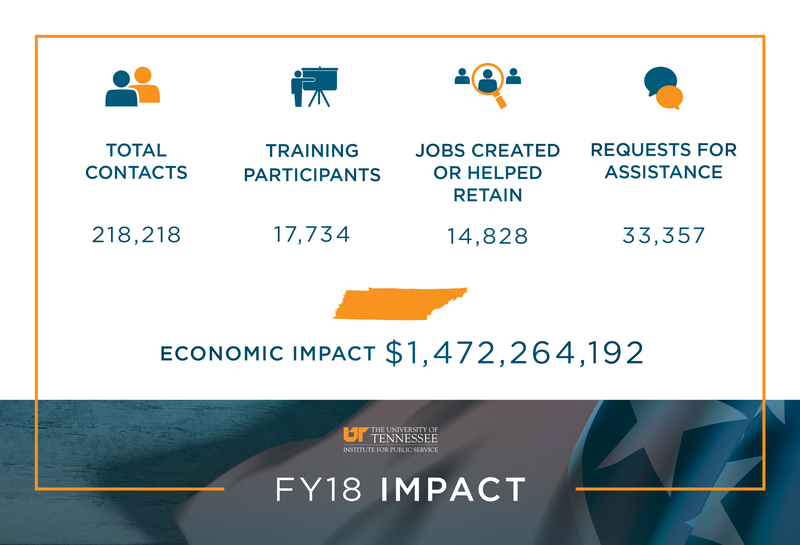 In an average year, IPS answers 23,000 requests for assistance, trains 20,000 municipal, county and state employees, manufacturers and law enforcement personnel and helps Tennessee companies generate $800 million of economic impact that supports more than 12,000 jobs statewide. Click on any district or county below to discover how IPS has made an impact in the area. The County Technical Assistance Service (CTAS) helped Fayette, McNairy and Hardeman counties each save $12,500 with development, maintenance, installation, training and technical support related to the CTAS County Highway Software Database and GIS Software. The software tracks road, bridge and sign inventory and location; fuel usage tracking, vehicle maintenance, materials usage, and labor, material, and equipment hours production reporting. With assistance from the Center for Industrial Services’ (CIS) Procurement Technical Assistance Center (PTAC) a Hardeman County business secured government contracts worth more than $27 million. PTAC consultants work with businesses across Tennessee to help coach them through the federal government contract process. An economic development team with the Center for Industrial Services (CIS), in partnership with the Tennessee Department of Economic and Community Development, facilitated asset-based planning sessions in McNairy and Hardeman counties. These planning sessions help rural counties build on their assets to promote economic growth. Fourteen law enforcement officers from Fayette County attended STOP Domestic Violence awareness training facilitated by LEIC. This 32-hour course provides instruction for investigating domestic violence incidents. The participants are better equipped to handle domestic violence situations as well as provide resources for victims. Representative John J. DeBerry Jr.
With assistance from the Center for Industrial Services’ (CIS) Procurement Technical Assistance Center (PTAC) several Shelby County businesses secured government contracts worth more than $40 million. PTAC consultants work with businesses across Tennessee to help coach them through the federal government contract process. The Municipal Technical Advisory Service (MTAS) human resources consultant worked with Lakeland to develop harassment in the workplace policies and to provide training for city employees on the new policies. A law enforcement officer from Shelby County completed the 10-week National Forensic Academy (NFA), a program of the Law Enforcement Innovation Center (LEIC). NFA participants are challenged in the various disciplines of crime scene investigation through classroom instruction, lab activities, and field practicums in the specialized courses. Shelby County’s purchasing department sought assistance from the County Technical Assistance Service (CTAS) to help streamline the procedures of the department. CIS provided Occupational Safety and Health Administration (OSHA) 511 training for general industry to employees of the University of Memphis Office of Environmental Health and Safety. At the request of the Franklin County sheriff, the jail management consultant from the County Technical Assistance Service (CTAS) worked closely with the department as it planned the new jail. He answered questions from the jail administrator and architects and provided a new jail design staffing analysis report. With assistance from the Center for Industrial Services’ (CIS) Procurement Technical Assistance Center (PTAC) several Franklin County businesses secured government contracts worth more than $900,000. PTAC consultants work with businesses across Tennessee to help coach them through the federal government contract process. Eleven law enforcement officers from Franklin County and one from Moore County attended STOP Domestic Violence awareness training facilitated by the Law Enforcement Innovation Center (LEIC). This 32-hour course provides instruction for investigating domestic violence incidents. The participants are better equipped to handle domestic violence situations as well as provide resources for victims. A utility operations consultant with the Municipal Technical Advisory Service (MTAS) assisted the city of Winchester wastewater plant with its biosolids land application. The MTAS municipal management consultant for Whitwell assisted the city in hiring a new police chief. CTAS helped Moore County save $12,500 with development, maintenance, installation, training and technical support related to the CTAS County Highway Software Database and GIS Software. The software tracks road, bridge and sign inventory and location; fuel usage tracking, vehicle maintenance, materials usage, and labor, material, and equipment hours production reporting. With assistance from the Center for Industrial Services’ (CIS) Procurement Technical Assistance Center (PTAC), several Knox County businesses won government contracts worth more than $90 million. PTAC consultants work with businesses across Tennessee to help coach them through the federal government contract process. The Knox County Sheriff’s Office sent all new officers through the applied de-escalation tactics course at the Law Enforcement Innovation Center (LEIC). The LEIC facility includes a 300-degree shooting simulator that provides participants an immersive training experience to react to scenarios using verbal commands, Taser, and firearms. Officers experience a diverse range of scenarios during the class designed to challenge their knowledge and decision-making abilities. A health and safety consultant with CIS conducted on-site medical waste worker training for 14 employees at University Health Systems. The Naifeh Center for Effective Leadership delivered several leadership topic addresses for the Knox County Procurement office. A county government consultant with the County Technical Assistance Service (CTAS) facilitated a planning session with the Knox County Office of Stormwater Management. Representative Harold M. Love Jr.
With assistance from the Center for Industrial Services’ (CIS) Procurement Technical Assistance Center (PTAC), several Davidson County businesses won government contracts worth more than $3 million. PTAC consultants work with businesses across Tennessee to help coach them through the federal government contract process. A CIS health and safety consultant provided aerial lift training for a Davidson County business. The consultant facilitated two, four-hour training courses. A property assessment consultant with the County Technical Assistance Service (CTAS) led a four-hour State Board of Equalization (SBOE) course for Davidson County’s Metro Board and hearing officers. The board of equalization is responsible for ensuring constitutional and statutory compliance in assessments of property for ad valorem taxes. More than 130 women, a number from Davidson County, attended the Women in Criminal Justice Conference hosted by the Naifeh Center for Effective Leadership. The attendees, from across the state, listened to talks on topics ranging from cybercrime to human trafficking. The Law Enforcement Innovation Center (LEIC) facilitated a Command Training course for the Tennessee Association of Police Chiefs and the Tennessee Sheriff’s Association in Nashville. More than 40 law enforcement personnel attended the training. With assistance from the Center for Industrial Services’ (CIS) Procurement Technical Assistance Center (PTAC) several Hamilton County businesses secured government contracts worth more than $160 million. PTAC consultants work with businesses across Tennessee to help coach them through the federal government contract process. The County Technical Assistance Service (CTAS) property assessment consultant aided the Hamilton County assessor’s office by providing information on County Board of Equalization training. The consultant also provided an email link to online training videos, certification forms and detailed instructions for submission to the State Board of Equalization. At the request of the UT Chattanooga health and safety department, CIS conducted a campus safety audit. More than 45 business owners and employees attended a crime prevention for business course hosted by the Law Enforcement Innovation Center (LEIC). The training taught business owners how to protect their facilities and their employees from crime. A budget and finance consultant with the Municipal Technical Advisory Service (MTAS) worked with Collegedale officials to prepare data for the Government Finance Officers Association Certificate of Achievement Award. The fire management consultant with the County Technical Assistance Service (CTAS) delivered an EMS overtime and staffing analysis study for Bradley County Emergency Medical Services. The study included a report to reduce non-planned overtime while creating a safer work environment for EMS crews and the citizens of Bradley County. A law enforcement officer from Bradley County completed the 10-week National Forensic Academy (NFA), a program of the Law Enforcement Innovation Center (LEIC). NFA participants are challenged in the various disciplines of crime scene investigation through classroom instruction, lab activities and field practicums in the specialized courses. The Center for Industrial Services (CIS) health and safety training team conducted confined space rescue training for a company in Bradley County. A Bradley County law enforcement officer attended the applied de-escalation tactics course at LEIC. The LEIC facility includes a 300-degree shooting simulator that provides participants an immersive training experience to react to scenarios using verbal commands, Taser and firearms. Officers experience a diverse range of scenarios during the class designed to challenge their knowledge and decision-making abilities. The fire management consultant with the Municipal Technical Advisory Service (MTAS) worked with the Mount Pleasant fire chief to modify and provide sample templates for fire personnel performance evaluation forms. A law enforcement officer from Maury County attended the 40-Hour Crime Scene Management course offered by the Law Enforcement Innovation Center (LEIC). Practical exercises in this course include digital photography, crime scene diagramming, proper methods of casting footwear and tire impressions, basic bloodstain pattern analysis, dusting for prints, and proper methods for collecting, packaging and preserving evidence. The County Technical Assistance Service (CTAS) assisted the Maury County budget director and county commission with preparing an implementation plan for a centralized finance office that is being adopted by a private act. A Center for Industrial Services solutions consultant worked with a Maury County manufacturer to develop and execute a Training Within Industry (TWI) Implementation Plan to improve employee training skills, productivity and reduce turnover. CTAS helped Maury County save $12,500 with development, maintenance, installation, training and technical support related to the CTAS County Highway Software Database and GIS Software. The software tracks road, bridge and sign inventory and location; fuel usage tracking, vehicle maintenance, materials usage, and labor, material, and equipment hours production reporting. The County Technical Assistance Service (CTAS) assisted Hardin, Lawrence, Lewis, and Wayne Counties in the development, maintenance, installation, training, and technical support of CTAS County Highway Software Database and GIS Software program for road, bridge and sign inventory and location, fuel usage tracking, vehicle maintenance, materials usage, and labor, material, and equipment hours production reporting. A CTAS consultant met with a Lewis County jail administrator and patrol lieutenant to review internal control processes, provide information on developing policy and procedure and a process to conduct self-audits. An economic development team with the Center for Industrial Services (CIS), in partnership with the Tennessee Department of Economic and Community Development, facilitated asset-based planning sessions in Hardin, Lewis, Wayne and Lawrence counties. These planning sessions help rural counties build on their assets to promote economic growth. A consultant with the Municipal Technical Advisory Service (MTAS) met with the Lawrence County solid waste director, his assistant and South West Tennessee Development District consultant to discuss information entered into annual progress report and needs assessment. A law enforcement officer from Hardin County attended the Command Level Leadership class hosted by the Law Enforcement Innovation Center (LEIC). This class is the capstone of LEIC’s leadership program. It is held once annually and serves executive level law enforcement personnel. With assistance from the Center for Industrial Services’ (CIS) Procurement Technical Assistance Center (PTAC) a Roane County business secured government contracts worth more than $9 million. PTAC consultants work with businesses across Tennessee to help coach them through the federal government contract process. Consultants also assisted a Loudon County business as it was awarded more than $11 million in government contracts. At the request of Roane County, the fire management consultant with the County Technical Assistance Service (CTAS) evaluated required state and federal ISO training requirements for the county fire department. The consultant compiled a sample year-long training calendar geared toward county fire departments with a mostly volunteer staff. A municipal management consultant with the Municipal Technical Advisory Service (MTAS) worked with the city of Harriman to coordinate, recruit and select a new general manager for the Harriman Utility Board. The jail management consultant with CTAS assisted Roane County with a jail needs assessment. Law enforcement officers from Roane and Loudon counties attended school resource officer basic training hosted by the Law Enforcement Innovation Center (LEIC). This five-day course is aimed at certifying officers to operate in a school setting. Participants will earn a school resource officer certification upon completion of this course. Topics include: roles and responsibilities, safety procedures, security and vulnerability, emergency management and active shooter. Thirteen law enforcement personnel from Sevier County attended STOP Domestic Violence awareness training facilitated by the Law Enforcement Innovation Center (LEIC). This 32-hour course provides instruction for investigating domestic violence incidents. The participants are better equipped to handle domestic violence situations as well as provide resources for victims. The Municipal Technical Advisory Service (MTAS) developed and facilitated an assessment center for the Sevierville Fire Department to identify the best candidates for a new deputy fire chief position in their department. Two law enforcement officers from Sevier County participated in LEIC’s 40-hour Crime Scene Operations course. Practical exercises in this course include digital photography, crime scene diagramming, proper methods of casting footwear and tire impressions, basic bloodstain pattern analysis, dusting for prints, and proper methods for collecting, packaging, and preserving evidence. The Center for Industrial Services (CIS) health and safety program conducted three sessions of a rope rescue refresher course for the Pigeon Forge Fire Department. An MTAS consultant oriented the new municipal court clerk for Pittman Center. She helped the clerk become familiar with the job roles and responsibilities. With assistance from the Center for Industrial Services’ (CIS) Procurement Technical Assistance Center (PTAC) a Williamson County business secured government contracts worth more than $400,000. PTAC consultants work with businesses across Tennessee to help coach them through the federal government contract process. The County Technical Assistance Service (CTAS) jail management consultant participated on Williamson County’s Triple J (juvenile, justice, jail) planning team. His role included providing a jail needs assessment for the county. Two law enforcement officers from Williamson County attended the 40-Hour Crime Scene Management course offered by the Law Enforcement Innovation Center (LEIC). Practical exercises in this course include digital photography, crime scene diagramming, proper methods of casting footwear and tire impressions, basic bloodstain pattern analysis, dusting for prints, and proper methods for collecting, packaging, and preserving evidence. CTAS helped Williamson County save $12,500 with development, maintenance, installation, training and technical support related to the CTAS County Highway Software Database and GIS Software. The software tracks road, bridge and sign inventory and location; fuel usage tracking, vehicle maintenance, materials usage, and labor, material, and equipment hours production reporting. With assistance from the Center for Industrial Services’ (CIS) Procurement Technical Assistance Center (PTAC) several businesses from Sullivan County secured government contracts worth more than $67 million. PTAC consultants work with businesses across Tennessee to help coach them through the federal government contract process. A law enforcement personnel from Sullivan County attended School Resource Officer basic training hosted by the Law Enforcement Innovation Center (LEIC). This five-day course is aimed at certifying officers to operate in a school setting. Participants will earn a school resource officer certification upon completion of this course. Topics include roles and responsibilities, safety procedures, security and vulnerability, emergency management and active shooter. The County Technical Assistance Service (CTAS) helped Sullivan County save $12,500 with development, maintenance, installation, training and technical support related to the CTAS County Highway Software Database and GIS Software. The software tracks road, bridge and sign inventory and location; fuel usage tracking, vehicle maintenance, materials usage, and labor, material, and equipment hours production reporting. Two law enforcement officers from Sullivan County attended the 40-Hour Crime Scene Management course offered by LEIC. Practical exercises in this course include digital photography, crime scene diagramming, proper methods of casting footwear and tire impressions, basic bloodstain pattern analysis, dusting for prints, and proper methods for collecting, packaging, and preserving evidence. At the request of a Maury County manufacturer, the Center for Industrial Services (CIS) provided several aspects of Lean manufacturing training. As a result, the company reported that it was able to save more than $2 million in production costs. A waste management consultant with the County Technical Assistance Service (CTAS) worked with Dickson County on a solid waste plan where the county decided to implement a solid waste disposal fee. The fee will bring in more than $2.4 million to the county. An economic development team with the Center for Industrial Services (CIS), in partnership with the Tennessee Department of Economic and Community Development, facilitated asset-based planning sessions in Hickman County. These planning sessions help rural counties build on their assets to promote economic growth. The CTAS fire management consultant aided the Hickman County Public Safety Committee of the County Commission regarding the overall operations of the fire departments. Committee agreed to establish minimum training requirements for all fire personnel. Fire Departments agreed to start developing automatic and mutual aid agreements and response standards. A law enforcement officer from Hickman County attended STOP Domestic Violence awareness training facilitated by the Law Enforcement Innovation Center (LEIC). This 32-hour course provides instruction for investigating domestic violence incidents. The participants are better equipped to handle domestic violence situations as well as provide resources for victims. With assistance from the Center for Industrial Services’ (CIS) Procurement Technical Assistance Center (PTAC) several Giles County businesses secured government contracts worth more than $80 million. PTAC consultants work with businesses across Tennessee to help coach them through the federal government contract process. At the request of the town of Lynnville, the Municipal Technical Advisory Service (MTAS) helped officials with the charter ratification process. An economic development team with the Center for Industrial Services (CIS), in partnership with the Tennessee Department of Economic and Community Development, facilitated asset-based planning sessions in Lawrence County. These planning sessions help rural counties build on their assets to promote economic growth. MTAS fire management consultants as well as a municipal management consultant assisted the Pulaski fire chief and mayor with developing a strategy to procure a fire apparatus for the city. The group reviewed the bid specifications, let the bid and evaluated all bids before selecting a vendor. A law enforcement officer from Lawrence County attended the 40-Hour Crime Scene Management course offered by the Law Enforcement Innovation Center (LEIC). Practical exercises in this course include digital photography, crime scene diagramming, proper methods of casting footwear and tire impressions, basic bloodstain pattern analysis, dusting for prints, and proper methods for collecting, packaging, and preserving evidence. At the request of Madison County, the jail management consultant with the County Technical Assistance Service (CTAS), provided input on the new jail project. He met with the architect to discuss needs and sought input on costs from other counties that had recently built new jails. A law enforcement officer from Madison County completed the 10-week National Forensic Academy (NFA), a program of the Law Enforcement Innovation Center (LEIC). NFA participants are challenged in the various disciplines of crime scene investigation through classroom instruction, lab activities, and field practicums in the specialized courses. The Municipal Technical Advisory Service (MTAS) assisted the city of Jackson’s human resource’s department with drafting a use of cell phone and other electronic devices policy. The CTAS fire management consultant provided direction to the Madison County Fire Department for the development of swift water and flood water response teams. The County Technical Assistance Service (CTAS) helped Greene, Cocke and Jefferson counties each save $12,500 with development, maintenance, installation, training and technical support related to the CTAS County Highway Software Database and GIS Software. The software tracks road, bridge and sign inventory and location; fuel usage tracking, vehicle maintenance, materials usage, and labor, material, and equipment hours production reporting. With assistance from the Center for Industrial Services’ (CIS) Procurement Technical Assistance Center (PTAC) several businesses in Greene County secured government contracts worth more than $33 million. PTAC consultants work with businesses across Tennessee to help coach them through the federal government contract process. A Cocke County law enforcement officer attended both the verbal de-escalation and applied de-escalation tactics classes offered by the Law Enforcement Innovation Center (LEIC). The LEIC facility includes a 300-degree shooting simulator that provides participants an immersive training experience to react to scenarios using verbal commands, Taser, and firearms. Officers experience a diverse range of scenarios during the class designed to challenge their knowledge and decision-making abilities. A utility operations consultant with the Municipal Technical Advisory Service (MTAS) assisted the Newport wastewater treatment plant with a biosolids land application and industrial pre-treatment application. The fire management consultant with CTAS assisted Cocke County with a USDA Rural Development grant application for a fire station and equipment. Two Jefferson County law enforcement officers attended the 40-Hour Crime Scene Management course offered by the Law Enforcement Innovation Center (LEIC). Practical exercises in this course include digital photography, crime scene diagramming, proper methods of casting footwear and tire impressions, basic bloodstain pattern analysis, dusting for prints, and proper methods for collecting, packaging, and preserving evidence. With assistance from the Center for Industrial Services’ (CIS) Procurement Technical Assistance Center (PTAC) a Sevier County business secured government contracts worth more than $1 million. PTAC consultants work with businesses across Tennessee to help coach them through the federal government contract process. The Municipal Technical Assistance Service (MTAS) wastewater consultant worked with Jefferson City on its bio-solids land application and regulatory enforcement response. A County Technical Assistance Service (CTAS) property assessment consultant discussed required County Board of Equalization training with the Jefferson County assessor. The consultant also discussed internal controls with the assessor. The Municipal Technical Advisory Service (MTAS) assisted Bells in developing specifications, estimates and the correct language for a paving bid package. The County Technical Assistance Service (CTAS) helped Crockett and Lauderdale counties each save $12,500 with development, maintenance, installation, training and technical support related to the CTAS County Highway Software Database and GIS Software. The software tracks road, bridge and sign inventory and location; fuel usage tracking, vehicle maintenance, materials usage, and labor, material, and equipment hours production reporting. A law enforcement officer from Lauderdale County attended the Supervising CSIs training offered by the Law Enforcement Innovation Center (LEIC). CTAS staff aided the newly appointed Haywood County sheriff. They answered questions on the drug fund, overtime, the county inmate workhouse and informed him of the New Sheriff’s School hosted by CTAS. An economic development team with the Center for Industrial Services (CIS), in partnership with the Tennessee Department of Economic and Community Development, facilitated asset-based planning sessions in Haywood and Lauderdale counties. These planning sessions help rural counties build on their assets to promote economic growth. The County Technical Assistance Service (CTAS) helped McMinn and Monroe counties each save $12,500 by maintaining and updating the CTAS Highway Program and GASB34 Asset Management software. The software allows the highway department to operate more efficiently, including maintenance analysis and scheduling, funding allocation requests, elimination of some field/site visits, and the streamlined ability to provide information. An economic development specialist from Monroe County completed the capstone project of the Tennessee Certified Economic Developer program offered by the Center for Industrial Services (CIS). The TCED program is tailored to give participants a broad-based knowledge of economic opportunities and trends, core components, and tools required to compete in today’s global economy, with a focus on economic development in Tennessee. CTAS’s jail management consultant conducted a jail staffing analysis report for McMinn County. At the request of the city of Athens, Municipal Technical Advisory Service (MTAS) human resource consultants conducted an assessment center to help the city recruit and hire a new human resource director. Two law enforcement officials from Monroe County attended STOP Domestic Violence awareness training facilitated by the Law Enforcement Innovation Center (LEIC). This 32-hour course provides instruction for investigating domestic violence incidents. The participants are better equipped to handle domestic violence situations as well as provide resources for victims. The Municipal Technical Advisory Service (MTAS) conducted a Municipal Management Academy for Morristown. The academy is for experienced managers and supervisors who want to become more effective, as well as those who have been recently appointed to supervisory positions in municipal government. With assistance from the Center for Industrial Services’ (CIS) Procurement Technical Assistance Center (PTAC), a Hamblen County business won government contracts worth more than $20 million. PTAC consultants work with businesses across Tennessee to help coach them through the federal government contract process. The jail management consultant with the County Technical Assistance Service (CTAS) answered questions from the Hamblen County chief deputy about searches of people entering the courthouse. Nine law enforcement officers from Hamblen County attended the applied de-escalation tactics course at the Law Enforcement Innovation Center (LEIC). The LEIC facility includes a 300-degree shooting simulator that provides participants an immersive training experience to react to scenarios using verbal commands, Taser, and firearms. Officers experience a diverse range of scenarios during the class designed to challenge their knowledge and decision-making abilities. At the request of a Carroll County manufacturer, the Center for Industrial Services (CIS) conducted a thorough review of the production process of several of their key pieces of equipment. The review resulted in two separate solutions that would save the company time and money. The solution the company chose resulted in $5.2 million in savings and increased production. The County Technical Assistance Service (CTAS) helped Carroll and Gibson counties each save $12,500 with development, maintenance, installation, training and technical support related to the CTAS County Highway Software Database and GIS Software. The software tracks road, bridge and sign inventory and location; fuel usage tracking, vehicle maintenance, materials usage, and labor, material, and equipment hours production reporting. With assistance from the CIS Procurement Technical Assistance Center (PTAC) a Gibson County business secured government contracts worth more than $12 million. PTAC consultants work with businesses across Tennessee to help coach them through the federal government contract process. An economic development team with the Center for Industrial Services (CIS), in partnership with the Tennessee Department of Economic and Community Development, facilitated asset-based planning sessions in Carroll County. These planning sessions help rural counties build on their assets to promote economic growth. A law enforcement officer from Gibson County attended the three-day advanced leadership and supervision course offered by the Law Enforcement Innovation Center (LEIC). The course covers topics including planning and decision making, fostering a positive work environment and conflict resolution. With assistance from the Center for Industrial Services’ (CIS) Procurement Technical Assistance Center (PTAC) several businesses in Greene County secured government contracts worth more than $32 million. PTAC consultants work with businesses across Tennessee to help coach them through the federal government contract process. The County Technical Assistance Service (CTAS) helped Greene County save $12,500 with development, maintenance, installation, training and technical support related to the CTAS County Highway Software Database and GIS Software. The software tracks road, bridge and sign inventory and location; fuel usage tracking, vehicle maintenance, materials usage, and labor, material, and equipment hours production reporting. Two law enforcement officers from Greene County attended STOP Domestic Violence awareness training facilitated by the Law Enforcement Innovation Center (LEIC). This 32-hour course provides instruction for investigating domestic violence incidents. The participants are better equipped to handle domestic violence situations as well as provide resources for victims. A consultant with the Municipal Technical Advisory Service (MTAS) developed and delivered a Municipal Management Academy class on motivating your workforce for the city of Greeneville. With assistance from the Center for Industrial Services’ (CIS) Procurement Technical Assistance Center (PTAC), several businesses in Hancock and Hawkins counties won government contracts worth more than $3 million. PTAC consultants work with businesses across Tennessee to help coach them through the federal government contract process. An economic development team with the Center for Industrial Services (CIS), in partnership with the Tennessee Department of Economic and Community Development, facilitated asset-based planning sessions in Hancock County. These planning sessions help rural counties build on their assets to promote economic growth. County Technical Assistance Service (CTAS) staff worked closely with the Hancock County assessor’s office on year-end reports including the assessment summary, the County Board of Equalization (CBOE) change report and the CBOE final action reports for the state. CTAS helped Hancock and Hawkins counties save $12,500 with development, maintenance, installation, training and technical support related to the CTAS County Highway Software Database and GIS Software. The software tracks road, bridge and sign inventory and location; fuel usage tracking, vehicle maintenance, materials usage, and labor, material, and equipment hours production reporting. A finance consultant with the Municipal Technical Advisory Service (MTAS) assisted the Sneedville city recorder with budget preparation and state budget submission. The County Technical Assistance Service (CTAS) helped Washington County save $12,500 with development, maintenance, installation, training and technical support related to the CTAS County Highway Software Database and GIS Software. The software tracks road, bridge and sign inventory and location; fuel usage tracking, vehicle maintenance, materials usage, and labor, material, and equipment hours production reporting. With assistance from the Center for Industrial Services’ (CIS) Procurement Technical Assistance Center (PTAC), several Washington County businesses won government contracts worth more than $77 million. PTAC consultants work with businesses across Tennessee to help coach them through the federal government contract process. A law enforcement officer from Washington County command-level leadership training hosted by the Law Enforcement Innovation Center (LEIC). This class is the capstone of LEIC’s leadership program. It is held once annually and serves executive level law enforcement personnel. At the request of the Jonesborough town administrator, a fire consultant with the Municipal Technical Advisory Service (MTAS) answered question on fire codes related to residential fire sprinkler system requirements. With assistance from the Center for Industrial Services’ (CIS) Procurement Technical Assistance Center (PTAC) several businesses from Sullivan and Johnson counties secured government contracts worth more than $100 million. PTAC consultants work with businesses across Tennessee to help coach them through the federal government contract process. A law enforcement officer from Sullivan County attended School Resource Officer basic training hosted by the Law Enforcement Innovation Center (LEIC). This five-day course is aimed at certifying officers to operate in a school setting. Participants will earn a school resource officer certification upon completion of this course. Topics include roles and responsibilities, safety procedures, security and vulnerability, emergency management and active shooter. The County Technical Assistance Service (CTAS) helped Sullivan, Carter and Johnson counties each save $12,500 with development, maintenance, installation, training and technical support related to the CTAS County Highway Software Database and GIS Software. The software tracks road, bridge and sign inventory and location; fuel usage tracking, vehicle maintenance, materials usage, and labor, material, and equipment hours production reporting. Representative John B. Holsclaw Jr. The County Technical Assistance Service (CTAS) helped Unicoi and Carter counties each save $12,500 with development, maintenance, installation, training and technical support related to the CTAS County Highway Software Database and GIS Software. The software tracks road, bridge and sign inventory and location; fuel usage tracking, vehicle maintenance, materials usage, and labor, material, and equipment hours production reporting. At the request of a Unicoi County business, the Center for Industrial Services (CIS) conducted on-site training for an internal audit team on how to perform internal audits to the ISO9001 standard. The training will ultimately save and retain the business $35 million in productions costs and sales. A CTAS law enforcement consultant conducted a risk assessment for the Unicoi County Sheriff’s Department. The Municipal Technical Advisory Service (MTAS) designed and facilitated a strategic planning retreat for the town of Unicoi. Two Carter County law enforcement officers attended the 40-Hour Crime Scene Management course offered by the Law Enforcement Innovation Center (LEIC). Practical exercises in this course include digital photography, crime scene diagramming, proper methods of casting footwear and tire impressions, basic bloodstain pattern analysis, dusting for prints, and proper methods for collecting, packaging, and preserving evidence. The County Technical Assistance Service (CTAS) helped Carroll, Obion and Weakley counties each save $12,500 with development, maintenance, installation, training and technical support related to the CTAS County Highway Software Database and GIS Software. The software tracks road, bridge and sign inventory and location; fuel usage tracking, vehicle maintenance, materials usage, and labor, material, and equipment hours production reporting. Fourteen UT Martin employees, who are assigned to investigate campus sexual assault reports, participated in training offered by the Law Enforcement Innovation Center (LEIC). LEIC is a provider for sexual misconduct training required for employees, who investigate such matters, for public higher education institutions. This is the result of a state bill that took effect July 1, which mandates that any employee of a public institution of higher education who investigates sexual misconduct must participate in annual training. A law enforcement officer from Bradley County completed the 10-week National Forensic Academy (NFA), a program of the Law Enforcement Innovation Center (LEIC). NFA participants are challenged in the various disciplines of crime scene investigation through classroom instruction, lab activities, and field practicums in the specialized courses. A human resources consultant with the Municipal Technical Advisory Service (MTAS) assisted the city of Decatur with a review of its personnel policy on investigation procedures. An economic development team with the Center for Industrial Services (CIS), in partnership with the Tennessee Department of Economic and Community Development, facilitated asset-based planning sessions in Meigs and Polk counties. These planning sessions help rural counties build on their assets to promote economic growth. The CTAS jail management consultant conducted a jail needs assessment for the Meigs County jail. The County Technical Assistance Service (CTAS) helped Montgomery County save $12,500 with development, maintenance, installation, training and technical support related to the CTAS County Highway Software Database and GIS Software. The software tracks road, bridge and sign inventory and location; fuel usage tracking, vehicle maintenance, materials usage, and labor, material, and equipment hours production reporting. With assistance from the Center for Industrial Services’ (CIS) Procurement Technical Assistance Center (PTAC) a Montgomery County business secured government contracts worth more than $250,000 million. PTAC consultants work with businesses across Tennessee to help coach them through the federal government contract process. The CTAS jail management consultant conducted a jail staffing analysis report for Montgomery County. Ten law enforcement personnel from Montgomery county attended STOP Domestic Violence awareness training facilitated by the Law Enforcement Innovation Center (LEIC). This 32-hour course provides instruction for investigating domestic violence incidents. The participants are better equipped to handle domestic violence situations as well as provide resources for victims. The Municipal Technical Advisory Service (MTAS) conducted two days of operator training at the Clarksville wastewater treatment facility. With assistance from the Center for Industrial Services’ (CIS) Procurement Technical Assistance Center (PTAC), several Macon County businesses won government contracts worth more than $8.5 million. PTAC consultants work with businesses across Tennessee to help coach them through the federal government contract process. Five law enforcement personnel from Macon County attended STOP Domestic Violence awareness training facilitated by the Law Enforcement Innovation Center (LEIC). This 32-hour course provides instruction for investigating domestic violence incidents. The participants are better equipped to handle domestic violence situations as well as provide resources for victims. A County Technical Assistance Service (CTAS) helped Clay, Macon Pickett, Scott and Fentress counties each save $12,500 with development, maintenance, installation, training and technical support related to the CTAS County Highway Software Database and GIS Software. The software tracks road, bridge and sign inventory and location; fuel usage tracking, vehicle maintenance, materials usage, and labor, material, and equipment hours production reporting. Thirteen law enforcement officers from Fentress County participated in School Resource Officer basic training hosted by the Law Enforcement Innovation Center (LEIC). This five-day course is aimed at certifying officers to operate in a school setting. Participants will earn a school resource officer certification upon completion of this course. Topics include roles and responsibilities, safety procedures, security and vulnerability, emergency management and active shooter. CTAS assisted the new Fentress County human resources director with drafting new personnel policies for the county. The Municipal Technical Advisory Service (MTAS) assisted the City of Springfield by preparing and presenting a four-year revenue sufficiency study for the city and incorporating an aggressive capital improvement program and additional debt issuance. A Robertson County manufacturer reported savings and increased sales totaling more than $90 million after the Center for Industrial Services (CIS) provided ISO 9000 quality management training for the facility. This class is the capstone of LEIC’s leadership program. It is held annually and serves executive level law enforcement personnel. The County Technical Assistance Service (CTAS) helped Robertson County save $12,500 with development, maintenance, installation, training and technical support related to the CTAS County Highway Software Database and GIS Software. The software tracks road, bridge and sign inventory and location; fuel usage tracking, vehicle maintenance, materials usage, and labor, material, and equipment hours production reporting. Eight law enforcement officers from Robertson County attended the three-day advanced leadership and supervision course offered by the Law Enforcement Innovation Center (LEIC). The course covers topics including planning and decision making, fostering a positive work environment and conflict resolution. With assistance from the Center for Industrial Services’ (CIS) Procurement Technical Assistance Center (PTAC) several Sumner County businesses secure government contracts worth more than $3 million. PTAC consultants work with businesses across Tennessee to help coach them through the federal government contract process. Fifteen law enforcement personnel from Sumner County attended STOP Domestic Violence awareness training facilitated by the Law Enforcement Innovation Center (LEIC). This 32-hour course provides instruction for investigating domestic violence incidents. The participants are better equipped to handle domestic violence situations as well as provide resources for victims. The County Technical Assistance Service (CTAS) helped Sumner County save $12,500 with development, maintenance, installation, training and technical support related to the CTAS County Highway Software Database and GIS Software. The software tracks road, bridge and sign inventory and location; fuel usage tracking, vehicle maintenance, materials usage, and labor, material, and equipment hours production reporting. At the request of the city of Millersville, the Municipal Technical Advisory Service (MTAS) facilitated a retreat for all employees. The County Technical Assistance Service (CTAS) helped Cheatham and Dickson counties each save $12,500 with development, maintenance, installation, training and technical support related to the CTAS County Highway Software Database and GIS Software. The software tracks road, bridge and sign inventory and location; fuel usage tracking, vehicle maintenance, materials usage, and labor, material, and equipment hours production reporting. A waste management consultant with CTAS worked with Dickson County on a solid waste plan where the county decided to implement a solid waste disposal fee. The fee will bring in more than $2.4 million to the county. Two law enforcement officers from Dickson County participated in Command Level Leadership training facilitated by the Law Enforcement Innovation Center (LEIC). The jail management consultant with the CTAS conducted a needs assessment project for Cheatham County. By using CTAS, instead of an outside firm, to conduct the study, the county saved $35,000. Five law enforcement personnel from Wilson County attended STOP Domestic Violence awareness training facilitated by the Law Enforcement Innovation Center (LEIC). This 32-hour course provides instruction for investigating domestic violence incidents. The participants are better equipped to handle domestic violence situations as well as provide resources for victims. The Center for Industrial Services (CIS) conducted a gap analysis for a Wilson County manufacturer. The analysis was to determine the company’s next steps in preparing for the new standard. By using CIS to conduct the analysis and making changes as a result of the study, the company generated more than $2 million in increased and retained production. At the request of the Mt. Juliet city manager, the Municipal Technical Advisory Service (MTAS) fire management consultant researched funding streams for county wide and municipal fire departments. The consultant provided a written opinion on appropriate funding for Wilson County and the City of Mount Juliet fire department services. The jail management consultant with the County Technical Assistance Service (CTAS) conducted a data gathering exercise with the Wilson County Sheriff’s Department. The County Technical Assistance Service (CTAS) helped Bedford and Lincoln counties each save $12,500 with development, maintenance, installation, training and technical support related to the CTAS County Highway Software Database and GIS Software. The software tracks road, bridge and sign inventory and location; fuel usage tracking, vehicle maintenance, materials usage, and labor, material, and equipment hours production reporting. A fire management consultant with the Municipal Technical Advisory Service (MTAS) assisted the city of Fayetteville in recruiting, assessing and selecting the most appropriate candidate to become the new fire chief. The consultant helped the city develop a job description, post an advertisement on various websites and evaluate 31 resumes. An MTAS finance consultant prepared a four-year revenue sufficiency study for the city of Fayetteville. The study included a projection in operating costs, a complex capital improvement plan and a structured debt service plan for the Fayetteville Public Utilities Water and Sewer Utility. The plan would ultimately bring in more than $280,000 to the city. Two law enforcement officers from Lincoln County participated in School Resource Officer basic training hosted by the Law Enforcement Innovation Center (LEIC). This five-day course is aimed at certifying officers to operate in a school setting. Participants will earn a school resource officer certification upon completion of this course. Topics include roles and responsibilities, safety procedures, security and vulnerability, emergency management and active shooter. With assistance from the Center for Industrial Services’ (CIS) Procurement Technical Assistance Center (PTAC) several Coffee County businesses secured government contracts worth more than $184 million. PTAC consultants work with businesses across Tennessee to help coach them through the federal government contract process. The County Technical Assistance Service (CTAS) helped Coffee County’s personnel and compensation committee review its personnel policies. Several changes were recommended including bringing the county emergency services into the county’s policies. A fire management consultant with the Municipal Technical Advisory Service (MTAS) assisted the Tullahoma fire chief with a check sheet to help his department document apparatus conditions such as tire tread depth. Four law enforcement officers from Coffee County attended STOP Domestic Violence awareness training facilitated by the Law Enforcement Innovation Center (LEIC). This 32-hour course provides instruction for investigating domestic violence incidents. The participants are better equipped to handle domestic violence situations as well as provide resources for victims. The CTAS jail management consultant conducted a jail needs assessment for Warren County. By using CTAS, instead of a private firm to conduct the study, the county saved $30,000. With assistance from the Center for Industrial Services’ (CIS) Procurement Technical Assistance Center (PTAC) a Monroe County business secured government contracts worth more than $10 million., and a Loudon County company brought in contracts worth more than $11 million. PTAC consultants work with businesses across Tennessee to help coach them through the federal government contract process. Three law enforcement officers from Monroe County and one from Loudon County attended STOP Domestic Violence awareness training facilitated by the Law Enforcement Innovation Center (LEIC). This 32-hour course provides instruction for investigating domestic violence incidents. The participants are better equipped to handle domestic violence situations as well as provide resources for victims. At the request of a Monroe County manufacturer, a CIS consultant conducted an on-site environmental compliance audit. Thirteen law enforcement professionals from within Loudon County participated in applied de-escalation tactics training at LEIC. The LEIC facility includes a 300-degree shooting simulator that provides participants an immersive training experience to react to scenarios using verbal commands, Taser, and firearms. Officers experience a diverse range of scenarios during the class designed to challenge their knowledge and decision-making abilities. The County Technical Assistance Service (CTAS) worked closely with the Monroe County trustee to eliminate accounts that were no longer valid and to review and clean up the balance sheet. With assistance from the Center for Industrial Services’ (CIS) Procurement Technical Assistance Center (PTAC), several Blount County businesses won government contracts worth more than $18 million. PTAC consultants work with businesses across Tennessee to help coach them through the federal government contract process. Twenty-four law enforcement officers from Blount County attended the applied de-escalation tactics course at the Law Enforcement Innovation Center (LEIC). The LEIC facility includes a 300-degree shooting simulator that provides participants an immersive training experience to react to scenarios using verbal commands, Taser, and firearms. Officers experience a diverse range of scenarios during the class designed to challenge their knowledge and decision-making abilities. A property assessment consultant with the County Technical Assistance Service (CTAS worked with the Blount County assessor’s office to provide information and online links to County Board of Equalization training for the staff. CIS provided trench rescue training levels 1 and 2 for the Maryville and Alcoa fire departments. The training instructs first responders on the rules for shoring trench walls and extricating collapse victims. At the request of the city of Maryville, the Municipal Technical Advisory Service (MTAS) provided customer service training to city employees. With assistance from the Center for Industrial Services’ (CIS) Procurement Technical Assistance Center (PTAC) a Rutherford County business secured government contracts worth more than $10 million. PTAC consultants work with businesses across Tennessee to help coach them through the federal government contract process. Nine law enforcement officers from Rutherford County attended STOP Domestic Violence awareness training facilitated by the Law Enforcement Innovation Center (LEIC). This 32-hour course provides instruction for investigating domestic violence incidents. The participants are better equipped to handle domestic violence situations as well as provide resources for victims. A law enforcement officer from Rutherford County completed the 10-week National Forensic Academy (NFA), a program of LEIC. NFA participants are challenged in the various disciplines of crime scene investigation through classroom instruction, lab activities, and field practicums in the specialized courses. At the request of the city of Murfreesboro city recorder, the Municipal Technical Advisory Service (MTAS) conducted financial reporting training for employees. Among other safety training, a CIS health and safety consultant conducted a basic rigger safety class for the Tennessee Association of Utility Districts. The County Technical Assistance Service (CTAS) helped Chester, Henderson, Decatur and Perry counties each save $12,500 with development, maintenance, installation, training and technical support related to the CTAS County Highway Software Database and GIS Software. The software tracks road, bridge and sign inventory and location; fuel usage tracking, vehicle maintenance, materials usage, and labor, material, and equipment hours production reporting. The Center for Industrial Services (CIS) provided leadership and supervision training for 12 employees at the request of a Decatur County manufacturer. A fire management consultant with the Municipal Technical Advisory Service (MTAS) assisted the city of Lexington fire department with annual physical ability testing and return to duty physical testing following an injury or illness. A CTAS finance and budget consultant worked with the Perry County sheriff with jail renovation grant paperwork to complete the energy efficient portion. The project saved the county about $20,000. With assistance from the Center for Industrial Services’ (CIS) Procurement Technical Assistance Center (PTAC), a Tipton County business won government contracts worth more than $6 million. PTAC consultants work with businesses across Tennessee to help coach them through the federal government contract process. Four law enforcement personnel from Tipton County attended STOP Domestic Violence awareness training facilitated by the Law Enforcement Innovation Center (LEIC). This 32-hour course provides instruction for investigating domestic violence incidents. The participants are better equipped to handle domestic violence situations as well as provide resources for victims. The County Technical Assistance Service (CTAS) helped Tipton County save $12,500 with development, maintenance, installation, training and technical support related to the CTAS County Highway Software Database and GIS Software. The software tracks road, bridge and sign inventory and location; fuel usage tracking, vehicle maintenance, materials usage, and labor, material, and equipment hours production reporting. A water consultant with the Municipal Technical Advisory Service (MTAS) worked with Brighton to address a drainage system failure. He worked with the mayor and utility department officials to develop a cost estimate to replace an old drainage pipe that was failing. A County Technical Assistance Service (CTAS) fire management consultant worked with the Cannon County emergency medical services director and county executive to discuss the status of the ambulance service personnel policies and standard operating procedures and guidelines. CTAS helped Cannon, DeKalb and Wilson counties each save $12,500 with development, maintenance, installation, training and technical support related to the CTAS County Highway Software Database and GIS Software. The software tracks road, bridge and sign inventory and location; fuel usage tracking, vehicle maintenance, materials usage, and labor, material, and equipment hours production reporting. With assistance from the Center for Industrial Services’ (CIS) Procurement Technical Assistance Center (PTAC), several businesses in Anderson County won government contracts worth more than $38 million. PTAC consultants work with businesses across Tennessee to help coach them through the federal government contract process. An economic development team with the Center for Industrial Services (CIS), in partnership with the Tennessee Department of Economic and Community Development, facilitated asset-based planning sessions in Campbell and Union counties. These planning sessions help rural counties build on their assets to promote economic growth. Thirteen law enforcement officers from Campbell County participated in School Resource Officer basic training hosted by the Law Enforcement Innovation Center (LEIC). This five-day course is aimed at certifying officers to operate in a school setting. Participants will earn a school resource officer certification upon completion of this course. Topics include roles and responsibilities, safety procedures, security and vulnerability, emergency management and active shooter. A consultant with the Municipal Technical Advisory Service (MTAS) conducted a program evaluation on the parks and recreation program for the city of Norris. The consultant presented the findings to the city manager. With assistance from the Center for Industrial Services’ (CIS) Procurement Technical Assistance Center (PTAC), several businesses in Anderson County won government contracts worth more than $37 million. PTAC consultants work with businesses across Tennessee to help coach them through the federal government contract process. A public works consultant with the Municipal Technical Advisory Service (MTAS) assisted the city of Oak Ridge with stormwater program compliance and provided a class for the staff on stormwater administrative hearings. A law enforcement officer from Anderson County completed the 10-week National Forensic Academy (NFA), a program of the Law Enforcement Innovation Center (LEIC). NFA participants are challenged in the various disciplines of crime scene investigation through classroom instruction, lab activities, and field practicums in the specialized courses. CIS provided two days of problem solving and 8D training for 16 employees at an Oak Ridge business. A finance consultant with MTAS worked with the Oliver Springs finance director on year-end accounting issues and new state laws that will have an impact on the city. The County Technical Assistance Service (CTAS) helped Houston, Humphreys and Montgomery counties each save $12,500 with development, maintenance, installation, training and technical support related to the CTAS County Highway Software Database and GIS Software. The software tracks road, bridge and sign inventory and location; fuel usage tracking, vehicle maintenance, materials usage, and labor, material, and equipment hours production reporting. At the request of New Johnsonville, a fire management consultant with the Municipal Technical Advisory Service (MTAS) assisted the fire department with apparatus replacement, reviewing the option of charging for fire services and their application of industry standards. The CTAS jail management consultant assisted Montgomery County with a jail staffing analysis. He examined jail space, number of inmates, and reviewing other needs before presenting the analysis to the county. By using CTAS to conduct the study, the county saved $10,000. With assistance from the Center for Industrial Services’ (CIS) Procurement Technical Assistance Center (PTAC) a Rutherford County business secured government contracts worth more than $30 million. PTAC consultants work with businesses across Tennessee to help coach them through the federal government contract process. At the request of the Dyersburg mayor, the Municipal Technical Advisory Service (MTAS) answered the call to conduct an assessment center to assist the city in hiring a new fire chief. The MTAS assessment center evaluates resumes and job requirements to help the city rank candidates for the position. The County Technical Assistance Service (CTAS) helped Lake, Dyer and Obion counties each save $12,500 with development, maintenance, installation, training and technical support related to the CTAS County Highway Software Database and GIS Software. The software tracks road, bridge and sign inventory and location; fuel usage tracking, vehicle maintenance, materials usage, and labor, material, and equipment hours production reporting. A law enforcement officer from Dyer County attended the 40-Hour Crime Scene Management course offered by the Law Enforcement Innovation Center (LEIC). Practical exercises in this course include digital photography, crime scene diagramming, proper methods of casting footwear and tire impressions, basic bloodstain pattern analysis, dusting for prints, and proper methods for collecting, packaging, and preserving evidence. An economic development team with the Center for Industrial Services (CIS), in partnership with the Tennessee Department of Economic and Community Development, facilitated asset-based planning sessions in Obion and Lake counties. These planning sessions help rural counties build on their assets to promote economic growth. With assistance from the Center for Industrial Services’ (CIS) Procurement Technical Assistance Center (PTAC) several Cumberland County businesses secured government contracts worth more than $200 million. PTAC consultants work with businesses across Tennessee to help coach them through the federal government contract process. A County Technical Assistance Service (CTAS) consultant developed a spreadsheet at the request of the Cumberland County mayor. The spreadsheet looked at property assessment valuation, penny value and revenue amounts. An economic development team with the Center for Industrial Services (CIS), in partnership with the Tennessee Department of Economic and Community Development, facilitated asset-based planning sessions in Van Buren County. These planning sessions help rural counties build on their assets to promote economic growth. A law enforcement officer from Cumberland County attended the 40-Hour Crime Scene Management course offered by the Law Enforcement Innovation Center (LEIC). Practical exercises in this course include digital photography, crime scene diagramming, proper methods of casting footwear and tire impressions, basic bloodstain pattern analysis, dusting for prints, and proper methods for collecting, packaging, and preserving evidence. The CTAS jail management consultant conducted a jail staffing analysis for Van Buren County. The analysis reviewed jail standards and included a coverage plan for the jail. With assistance from the Center for Industrial Services’ (CIS) Procurement Technical Assistance Center (PTAC), a Claiborne County business won government contracts close to $4 million. PTAC consultants work with businesses across Tennessee to help coach them through the federal government contract process. At the request of the Claiborne County property assessor, the County Technical Assistance Service (CTAS) provided training for the assessor’s office on the county mass appraisal software. An economic development team with the Center for Industrial Services (CIS), in partnership with the Tennessee Department of Economic and Community Development, facilitated asset-based planning sessions in Union, Claiborne and Grainger counties. These planning sessions help rural counties build on their assets to promote economic growth. A CTAS property assessment consultant provided training on the county mass appraisal software to the Claiborne County assessor’s office staff. The consultant instructed the staff on building queries for sales ratio analysis and creating data queries for commercial and industrial properties. Two law enforcement officers from Grainger County attended the 40-Hour Crime Scene Management course offered by the Law Enforcement Innovation Center (LEIC). Practical exercises in this course include digital photography, crime scene diagramming, proper methods of casting footwear and tire impressions, basic bloodstain pattern analysis, dusting for prints, and proper methods for collecting, packaging, and preserving evidence. At the request of the new Rutledge city recorder, a finance consultant with the Municipal Technical Advisory Service (MTAS) assisted with the previous year’s payroll reports and 1099 forms. With assistance from the Center for Industrial Services’ (CIS) Procurement Technical Assistance Center (PTAC), a Hardeman County business won government contracts close worth more than $28 million. PTAC consultants work with businesses across Tennessee to help coach them through the federal government contract process. A county government consultant with the County Technical Assistance Service (CTAS) worked with the new Hardeman County road superintendent on a County Officials Orientation Program (COOP) checklist for the office. A law enforcement officer from Hardeman County attended STOP Domestic Violence awareness training facilitated by the Law Enforcement Innovation Center (LEIC). This 32-hour course provides instruction for investigating domestic violence incidents. The participants are better equipped to handle domestic violence situations as well as provide resources for victims. At the request of the Jackson water department, a utility consultant with the Municipal Technical Advisory Service (MTAS) answered questions about the department’s water loss report and certification issues. An economic development team with the Center for Industrial Services (CIS), in partnership with the Tennessee Department of Economic and Community Development, facilitated asset-based planning sessions in Hardeman County. These planning sessions help rural counties build on their assets to promote economic growth. Two law enforcement personnel from Warren County attended School Resource Officer basic training hosted by the Law Enforcement Innovation Center (LEIC). This five-day course is aimed at certifying officers to operate in a school setting. Participants will earn a school resource officer certification upon completion of this course. Topics include roles and responsibilities, safety procedures, security and vulnerability, emergency management and active shooter. The Center for Industrial Services (CIS) provided ISO 9001 training for a business in Warren County. As a result of the training, the business saw more than $1.6 million in increased and retained production. The County Technical Assistance Service (CTAS) helped White, Grundy and Warren counties each save $12,500 with development, maintenance, installation, training and technical support related to the CTAS County Highway Software Database and GIS Software. The software tracks road, bridge and sign inventory and location; fuel usage tracking, vehicle maintenance, materials usage, and labor, material, and equipment hours production reporting. A Municipal Technical Advisory Service (MTAS) human resources consultant worked with the city of Sparta to revise its personnel policies and assisted with presenting the new policies to the city council. An economic development team with the Center for Industrial Services (CIS), in partnership with the Tennessee Department of Economic and Community Development, facilitated asset-based planning sessions in White and Grundy counties. These planning sessions help rural counties build on their assets to promote economic growth. With assistance from the Center for Industrial Services’ (CIS) Procurement Technical Assistance Center (PTAC) Marshall and Franklin county businesses secured government contracts worth more than $2.4 million. PTAC consultants work with businesses across Tennessee to help coach them through the federal government contract process. A county government consultant with the County Technical Assistance Service (CTAS) worked with the Marshall County finance director in preparation of financial statements to submit for the Government Finance Officer Association financial reporting award. Four law enforcement officers from Franklin and Lincoln counties attended the school resource officer basic training hosted by the Law Enforcement Innovation Center (LEIC). This five-day course is aimed at certifying officers to operate in a school setting. Participants will earn a school resource officer certification upon completion of this course. Topics include roles and responsibilities, safety procedures, security and vulnerability, emergency management and active shooter. A finance consultant with the Municipal Technical Advisory Service (MTAS) assisted the town of Jasper with converting its employee retirement plan to the Tennessee Consolidated Retirement Plan. CTAS helped Marshall, Franklin, Lincoln and Marion counties each save $12,500 with development, maintenance, installation, training and technical support related to the CTAS County Highway Software Database and GIS Software. The software tracks road, bridge and sign inventory and location; fuel usage tracking, vehicle maintenance, materials usage, and labor, material, and equipment hours production reporting. The County Technical Assistance Service (CTAS) helped Bledsoe, Sequatchie, Rhea and Roane counties each save $12,500 with development, maintenance, installation, training and technical support related to the CTAS County Highway Software Database and GIS Software. The software tracks road, bridge and sign inventory and location; fuel usage tracking, vehicle maintenance, materials usage, and labor, material, and equipment hours production reporting. With assistance from the Center for Industrial Services’ (CIS) Procurement Technical Assistance Center (PTAC) a Rhea County business secured government contracts worth more than $9 million. Consultants helped a Sequatchie County business win a contract close to $200,000. PTAC consultants work with businesses across Tennessee to help coach them through the federal government contract process. The jail management consultant with CTAS conducted a jail needs assessment for Rhea County. The county saved $30,000 by using CTAS, rather than a private company, to conduct the study. A finance consultant with the Municipal Technical Advisory Service (MTAS) worked closely with the Graysville finance office in closing the previous year’s budget. A law enforcement officer from Sequatchie County attended STOP Domestic Violence awareness training facilitated by the Law Enforcement Innovation Center (LEIC). This 32-hour course provides instruction for investigating domestic violence incidents. The participants are better equipped to handle domestic violence situations as well as provide resources for victims. With assistance from the Center for Industrial Services’ (CIS) Procurement Technical Assistance Center (PTAC) several Sumner County businesses secured government contracts worth more than $3.8 million. PTAC consultants work with businesses across Tennessee to help coach them through the federal government contract process. The County Technical Assistance Service (CTAS) helped Trousdale, Smith, DeKalb and Sumner counties each save $12,500 with development, maintenance, installation, training and technical support related to the CTAS County Highway Software Database and GIS Software. The software tracks road, bridge and sign inventory and location; fuel usage tracking, vehicle maintenance, materials usage, and labor, material, and equipment hours production reporting. A municipal management consultant with the Municipal Technical Advisory Service (MTAS) assisted the city of Liberty with a rental lease agreement for its community center. A fire management consultant with MTAS answered questions from the Alexandria mayor in reference to the town establishing a fire department by ordinance, how to equip the department and how to purchase capital equipment such as fire apparatus. The Center for Industrial Services (CIS) assisted a Putnam County company in the design and development of a traffic monitoring system for highway emergency and work zone use. Two law enforcement officers from Putnam County attended the applied de-escalation tactics course at the Law Enforcement Innovation Center (LEIC). The LEIC facility includes a 300-degree shooting simulator that provides participants an immersive training experience to react to scenarios using verbal commands, Taser, and firearms. Officers experience a diverse range of scenarios during the class designed to challenge their knowledge and decision-making abilities. CIS provided OSHA 10-Hour General Industry Class training to employees of the Tennessee Department of Public Health, Upper Cumberland Region. The County Technical Assistance Service (CTAS) assisted Putnam County with a bond refunding worth more than $2 million. The County Technical Assistance Service (CTAS) helped Jackson, Morgan, Fentress and Overton counties each save $12,500 with development, maintenance, installation, training and technical support related to the CTAS County Highway Software Database and GIS Software. The software tracks road, bridge and sign inventory and location; fuel usage tracking, vehicle maintenance, materials usage, and labor, material, and equipment hours production reporting. A municipal management consultant with the Municipal Technical Advisory Service (MTAS) advised the city of Gainsboro with recommendations for police drug fund accounting of records. With assistance from the Center for Industrial Services’ (CIS) Procurement Technical Assistance Center (PTAC) a Morgan County business secured government contracts worth more than $200,000. PTAC consultants work with businesses across Tennessee to help coach them through the federal government contract process. A County Technical Assistance Service (CTAS) solid waste management consultant advised the Henry County solid waste director on possible Tennessee Department of Environment and Conservation grants and on the disposal of waste tires. A law enforcement officer from Henry County attended the three-day advanced leadership and supervision course offered by the Law Enforcement Innovation Center (LEIC). The course covers topics including planning and decision making, fostering a positive work environment and conflict resolution. At the request of Stewart County, a CTAS county government consultant assisted the highway department in purchasing heavy equipment from the state contract. CTAS helped Benton County save $12,500 with development, maintenance, installation, training and technical support related to the CTAS County Highway Software Database and GIS Software. The software tracks road, bridge and sign inventory and location; fuel usage tracking, vehicle maintenance, materials usage, and labor, material, and equipment hours production reporting. A consultant with the County Technical Assistance Service (CTAS) provided the Cumberland County assessor’s office with a copy of the CTAS internal controls guidebook. He also discussed with them the importance of having controls in place specific to the office. CTAS helped Bledsoe, Jackson and Overton counties each save $12,500 with development, maintenance, installation, training and technical support related to the CTAS County Highway Software Database and GIS Software. The software tracks road, bridge and sign inventory and location; fuel usage tracking, vehicle maintenance, materials usage, and labor, material, and equipment hours production reporting. CIS delivered an Occupational Safety and Health Administration (OSHA) 10-hour general industry class to 36 employees with the Tennessee Department of Public Health’s Upper Cumberland Region. Two Putnam County law enforcement officers attended the 40-Hour Crime Scene Management course offered by the Law Enforcement Innovation Center (LEIC). Practical exercises in this course include digital photography, crime scene diagramming, proper methods of casting footwear and tire impressions, basic bloodstain pattern analysis, dusting for prints, and proper methods for collecting, packaging, and preserving evidence. Five law enforcement personnel from Wilson and Macon counties attended STOP Domestic Violence awareness training facilitated by the Law Enforcement Innovation Center (LEIC). This 32-hour course provides instruction for investigating domestic violence incidents. The participants are better equipped to handle domestic violence situations as well as provide resources for victims. CTAS helped Cannon, Clay, DeKalb, Macon and Smith counties each save $12,500 with development, maintenance, installation, training and technical support related to the CTAS County Highway Software Database and GIS Software. The software tracks road, bridge and sign inventory and location; fuel usage tracking, vehicle maintenance, materials usage, and labor, material, and equipment hours production reporting. The Municipal Technical Advisory Service (MTAS) assisted the town of Alexandria with maintenance of the budget for the fiscal year for general and water and sewer funds. He also created forms and schedules for them that are required by the state in order for the budget to be approved. With assistance from the Center for Industrial Services’ (CIS) Procurement Technical Assistance Center (PTAC) a Monroe County business secured government contracts worth more than $10 million. PTAC consultants work with businesses across Tennessee to help coach them through the federal government contract process. The County Technical Assistance Service (CTAS) helped Cannon, Clay, DeKalb, Macon and Smith counties each save $12,500 with development, maintenance, installation, training and technical support related to the CTAS County Highway Software Database and GIS Software. The software tracks road, bridge and sign inventory and location; fuel usage tracking, vehicle maintenance, materials usage, and labor, material, and equipment hours production reporting. Seven law enforcement personnel from McMinn and Monroe counties attended STOP Domestic Violence awareness training facilitated by the Law Enforcement Innovation Center (LEIC). This 32-hour course provides instruction for investigating domestic violence incidents. The participants are better equipped to handle domestic violence situations as well as provide resources for victims. The jail management consultant with the County Technical Assistance Service (CTAS) assisted Franklin County in conducting a jail staffing analysis. His analysis found that with new staff positions should be created with salaries and benefits close to $440,000. A fire management consultant with the Municipal Technical Advisory Service (MTAS) worked closed with the Monteagle mayor and fire department to fire administration/operations improvements. He conducted an inventory of ISO related equipment and personal protective equipment. CTAS helped Coffee, Franklin, Grundy, Marion, Sequatchie, Van Buren and Warren counties each save $12,500 with development, maintenance, installation, training and technical support related to the CTAS County Highway Software Database and GIS Software. The software tracks road, bridge and sign inventory and location; fuel usage tracking, vehicle maintenance, materials usage, and labor, material, and equipment hours production reporting. Two law enforcement personnel from Warren County attended School Resource Officer basic training hosted by the Law Enforcement Innovation Center (LEIC). This five-day course is aimed at certifying officers to operate in a school setting. Participants will earn a school resource officer certification upon completion of this course. Topics include: roles and responsibilities, safety procedures, security and vulnerability, emergency management and active shooter. Staff with the Municipal Technical Advisory Service (MTAS) helped the city of Elizabethton recruit a new city manager. Before the position was filled, MTAS staff assisted the city finance director and interim city manager on year-end financials. The County Technical Assistance Service (CTAS) helped Washington, Unicoi and Carter counties each save $12,500 with development, maintenance, installation, training and technical support related to the CTAS County Highway Software Database and GIS Software. The software tracks road, bridge and sign inventory and location; fuel usage tracking, vehicle maintenance, materials usage, and labor, material, and equipment hours production reporting. MTAS saved the town of Erwin save $25,000 by working with its public works department to bid a project for culvert repair. With assistance from the Center for Industrial Services’ (CIS) Procurement Technical Assistance Center (PTAC), several Washington County businesses won government contracts worth more than $90 million. PTAC consultants work with businesses across Tennessee to help coach them through the federal government contract process. The County Technical Assistance Service (CTAS) helped Stewart, Houston and Montgomery counties each save $12,500 with development, maintenance, installation, training and technical support related to the CTAS County Highway Software Database and GIS Software. The software tracks road, bridge and sign inventory and location; fuel usage tracking, vehicle maintenance, materials usage, and labor, material, and equipment hours production reporting. A municipal management consultant with the Municipal Technical Advisory Service (MTAS) assisted the Erin city recorder on questions regarding re-districting and voting. The County Technical Assistance Service (CTAS) helped Chester, Henderson, Decatur, Fayette, Hardin and McNairy counties each save $12,500 with development, maintenance, installation, training and technical support related to the CTAS County Highway Software Database and GIS Software. The software tracks road, bridge and sign inventory and location; fuel usage tracking, vehicle maintenance, materials usage, and labor, material, and equipment hours production reporting. Two law enforcement officers from Chester County attended the school resource officer basic training hosted by the Law Enforcement Innovation Center (LEIC). This five-day course is aimed at certifying officers to operate in a school setting. Participants will earn a school resource officer certification upon completion of this course. Topics include: roles and responsibilities, safety procedures, security and vulnerability, emergency management and active shooter. With assistance from the Center for Industrial Services’ (CIS) Procurement Technical Assistance Center (PTAC) several Sumner County businesses secured government contracts worth more than $7 million. PTAC consultants work with businesses across Tennessee to help coach them through the federal government contract process. A municipal management consultant with the Municipal Technical Advisory Service (MTAS) facilitated a strategic planning session for the city of Millersville. Fifteen law enforcement personnel from Sumner and Davidson counties attended STOP Domestic Violence awareness training facilitated by the Law Enforcement Innovation Center (LEIC). This 32-hour course provides instruction for investigating domestic violence incidents. The participants are better equipped to handle domestic violence situations as well as provide resources for victims. The County Technical Assistance Service (CTAS) helped Trousdale and Sumner counties each save $12,500 with development, maintenance, installation, training and technical support related to the CTAS County Highway Software Database and GIS Software. The software tracks road, bridge and sign inventory and location; fuel usage tracking, vehicle maintenance, materials usage, and labor, material, and equipment hours production reporting. A fire management consultant with MTAS recommended to the city of Gallatin that it hire a fire inspector. The city acted on the recommendation of the consultant and added a fire inspector to its employee base. The Municipal Technical Advisory Service (MTAS) continued to work with the city of Memphis to provide a variety of training for city employees. The training classes included customer service, leading and managing change and navigating the multi-generational workplace. MTAS also partnered with the city’s Professional Development Institute (PDI) to create a series of certificate programs: the Management and Leader Certificate Program, the Administrative Certificate Program and the Professional Certificate Program. With assistance from the Center for Industrial Services’ (CIS) Procurement Technical Assistance Center (PTAC), a Giles County business won government contracts worth more than $89 million. PTAC consultants work with businesses across Tennessee to help coach them through the federal government contract process. The Municipal Technical Advisory Service (MTAS) provided utility board training for the Lynnville mayor and board of aldermen. The County Technical Assistance Service (CTAS) helped Giles, Lawrence, Lewis, Maury, Perry and Wayne counties each save $12,500 with development, maintenance, installation, training and technical support related to the CTAS County Highway Software Database and GIS Software. The software tracks road, bridge and sign inventory and location; fuel usage tracking, vehicle maintenance, materials usage, and labor, material, and equipment hours production reporting. Three law enforcement officers from Maury County attended the 40-Hour Crime Scene Management course offered by the Law Enforcement Innovation Center (LEIC). Practical exercises in this course include digital photography, crime scene diagramming, proper methods of casting footwear and tire impressions, basic bloodstain pattern analysis, dusting for prints, and proper methods for collecting, packaging, and preserving evidence. An MTAS finance consultant assisted the Ethridge city recorder in preparation of the annual fiscal year budget and budget submittal documents required by the Tennessee Comptroller’s office of state and local finance. The CTAS jail management consultant conducted a jail staffing analysis for Lewis County. He also worked with the jail administrator about the facility’s internal controls policy. With assistance from the Center for Industrial Services’ (CIS) Procurement Technical Assistance Center (PTAC) a Roane County business secured government contracts worth more than $12 million. PTAC consultants work with businesses across Tennessee to help coach them through the federal government contract process. The CIS PTAC consultants also helped a Morgan County company receive nearly $200,000 in government contracts. Thirteen law enforcement officers from Campbell and Fentress counties participated in School Resource Officer basic training hosted by the Law Enforcement Innovation Center (LEIC). This five-day course is aimed at certifying officers to operate in a school setting. Participants will earn a school resource officer certification upon completion of this course. Topics include: roles and responsibilities, safety procedures, security and vulnerability, emergency management and active shooter. A municipal finance consultant with the Municipal Technical Advisory Service (MTAS) worked with the city of Dayton to complete an application to be considered for the Government Finance Officers Association Certificate of Achievement Award. With assistance from the Center for Industrial Services’ (CIS) Procurement Technical Assistance Center (PTAC), a Dyer County business won government contracts worth more than $30 million. PTAC consultants work with businesses across Tennessee to help coach them through the federal government contract process. The County Technical Assistance Service (CTAS) helped Madison, Crockett, Dyer, Lake and Lauderdale counties each save $12,500 with development, maintenance, installation, training and technical support related to the CTAS County Highway Software Database and GIS Software. The software tracks road, bridge and sign inventory and location; fuel usage tracking, vehicle maintenance, materials usage, and labor, material, and equipment hours production reporting. The Municipal Technical Advisory Service (MTAS) developed specifications, estimates and language for a paving bid package for Bells. At the request of the city of Brentwood, the Municipal Technical Advisory Service (MTAS) conducted a class for planning commission members that addressed public records and open meetings. At the request of the city of Bristol, the Municipal Technical Advisory Service (MTAS) assisted in the recruitment and assessment center for a new fire chief. A law enforcement personnel from Sullivan County attended School Resource Officer basic training hosted by the Law Enforcement Innovation Center (LEIC). This five-day course is aimed at certifying officers to operate in a school setting. Participants will earn a school resource officer certification upon completion of this course. Topics include: roles and responsibilities, safety procedures, security and vulnerability, emergency management and active shooter. With assistance from the Center for Industrial Services’ (CIS) Procurement Technical Assistance Center (PTAC), several businesses in Anderson, Loudon and Knox counties won government contracts worth more than $140 million. PTAC consultants work with businesses across Tennessee to help coach them through the federal government contract process. A consultant with the Municipal Technical Advisory Service (MTAS) conducting a program evaluation on the parks and recreation program for the city of Norris. The consultant presented the findings to the city manager. The County Technical Assistance Services (CTAS) helped Loudon County save $12,500 with development, maintenance, installation, training and technical support related to the CTAS County Highway Software Database and GIS Software. The software tracks road, bridge and sign inventory and location; fuel usage tracking, vehicle maintenance, materials usage, and labor, material, and equipment hours production reporting. With assistance from the Center for Industrial Services’ (CIS) Procurement Technical Assistance Center (PTAC), several businesses in Claiborne Hancock and Hawkins counties won government contracts worth more than $8 million. PTAC consultants work with businesses across Tennessee to help coach them through the federal government contract process. CTAS staff worked closely with the Hancock County assessor’s office on year-end reports including the assessment summary, the County Board of Equalization (CBOE) change report and the CBOE final action reports for the state. At the request of the Mount Carmel city administrator, the Municipal Technical Advisory Service (MTAS) fire management consultant conducted a comprehensive fire department study for the city. The Municipal Technical Advisory Service (MTAS) saved Covington more than $6 million by recommending they table their plans for a new police station. Thirteen law enforcement personnel from Sevier and Blount counties attended STOP Domestic Violence awareness training facilitated by the Law Enforcement Innovation Center (LEIC). This 32-hour course provides instruction for investigating domestic violence incidents. The participants are better equipped to handle domestic violence situations as well as provide resources for victims. With assistance from the Center for Industrial Services’ (CIS) Procurement Technical Assistance Center (PTAC) a Blount County business secured government contracts worth more than $19 million. PTAC consultants work with businesses across Tennessee to help coach them through the federal government contract process. The CIS health and safety program provided trench rescue training for the Maryville and Alcoa fire departments. A finance consultant with the Municipal Technical Advisory Service (MTAS) prepared and presented a four-year revenue sufficiency study for the city of Springfield. A Robertson County manufacturer reported savings and increased sales totaling more than $90 million after the Center for Industrial Services (CIS) provided ISO 9000 quality management training for the facility. Two law enforcement officers from Dickson County participated in Command Level Leadership training facilitated by the Law Enforcement Innovation Center (LEIC). This class is the capstone of LEIC’s leadership program. It is held annually and serves executive level law enforcement personnel. The County Technical Assistance Service (CTAS) helped Cheatham, Dickson, Hickman, Humphreys and Robertson counties each save $12,500 with development, maintenance, installation, training and technical support related to the CTAS County Highway Software Database and GIS Software. The software tracks road, bridge and sign inventory and location; fuel usage tracking, vehicle maintenance, materials usage, and labor, material, and equipment hours production reporting. The jail management consultant with CTAS conducted a needs assessment project for Cheatham County. By using CTAS, instead of an outside firm, to conduct the study, the county saved $35,000. With assistance from the Center for Industrial Services’ (CIS) Procurement Technical Assistance Center (PTAC) several businesses in Greene and Hamblen counties secured government contracts worth more than $54 million. PTAC consultants work with businesses across Tennessee to help coach them through the federal government contract process. The Municipal Technical Advisory Service (MTAS) conducted a Municipal Management Academy for the city of Memphis. The academy is for experienced managers and supervisors who want to become more effective, as well as those who have been recently appointed to supervisory positions in municipal government. The County Technical Assistance Service (CTAS) helped Greene, Cocke and Hamblen counties each save $12,500 with development, maintenance, installation, training and technical support related to the CTAS County Highway Software Database and GIS Software. The software tracks road, bridge and sign inventory and location; fuel usage tracking, vehicle maintenance, materials usage, and labor, material, and equipment hours production reporting. Law Enforcement officers from Hamblen and Cocke counties participated in a applied de-escalation tactics course at the Law Enforcement Innovation Center (LEIC). The LEIC facility includes a 300-degree shooting simulator that provides participants an immersive training experience to react to scenarios using verbal commands, Taser, and firearms. Officers experience a diverse range of scenarios during the class designed to challenge their knowledge and decision-making abilities. The County Technical Assistance Service (CTAS) helped Benton, Carroll, Gibson, Henry, Obion and Weakley counties each save $12,500 with development, maintenance, installation, training and technical support related to the CTAS County Highway Software Database and GIS Software. The software tracks road, bridge and sign inventory and location; fuel usage tracking, vehicle maintenance, materials usage, and labor, material, and equipment hours production reporting. A fire management consultant with the Municipal Technical Advisory Service (MTAS) advised the Dyer fire chief on firefighter self-contained breathing apparatus fit testing and medical evaluation requirements. With assistance from the Center for Industrial Services’ (CIS) Procurement Technical Assistance Center (PTAC) several Marshall and Rutherford county businesses secured government contracts worth more than $13 million. PTAC consultants work with businesses across Tennessee to help coach them through the federal government contract process. The County Technical Assistance Service (CTAS) helped Bedford, Lincoln, Marshall, Moore and Rutherford counties each save $12,500 with development, maintenance, installation, training and technical support related to the CTAS County Highway Software Database and GIS Software. The software tracks road, bridge and sign inventory and location; fuel usage tracking, vehicle maintenance, materials usage, and labor, material, and equipment hours production reporting. Ten law enforcement personnel from Moore and Rutherford counties attended STOP Domestic Violence awareness training facilitated by the Law Enforcement Innovation Center (LEIC). This 32-hour course provides instruction for investigating domestic violence incidents. The participants are better equipped to handle domestic violence situations as well as provide resources for victims. A budget and finance consultant with CTAS assisted the new Moore County mayor and director of schools with reviewing the county’s current debt load and the school capital project. He reviewed additional revenue streams with the mayor to assist with debt service funding. With assistance from the Center for Industrial Services’ (CIS) Procurement Technical Assistance Center (PTAC), several Rutherford County businesses won government contracts worth more than $7 million. PTAC consultants work with businesses across Tennessee to help coach them through the federal government contract process. A property assessment coordinator with the County Technical Assistance Service (CTAS) reviewed Rutherford County’s process for reappraisal and looked over the property assessor’s upcoming presentation. At the request of the Murfreesboro Fire Department, a fire management consultant with the Municipal Technical Advisory Service worked with the chief to develop components to assess current staff members to fill four battalion chief positions. The department was adding three new positions and replacing a retired battalion chief. A health and safety consultant with CIS taught a basic rigger class for the Tennessee Association of Utility Districts. More than 22 employees attended the class.